31st March, it was 3 A.M. I got up after sleeping for about a few hours and my body is still needs to recuperate from yesterday's work. At 4 AM, I am still in Pampanga and have to travel again with Tessa and Laila to get to Bonifacio Global City in Taguig to meet up with the rest of the crew who are joining with the rest people from Angeles City who are about to embark on a Team Building Training for Top Brokers. I got apprehended of the thoughts of having a good time, meeting new people from different places and at the same time having a fun pleasurable time with outdoor activities in Lake Caliraya. At 5 A.M., as we approach the Metro. Traffic was heavy on North Luzon Expressway from the Balintawak exit to EDSA Cloverleaf because it was a rush of vehicles off to work on a very hectic Monday converging to Metro Manila from the nearby provinces. I was thrilled on seeing the bright lights off Metro Manila because I am always busy in the province and the thought of visiting Laguna and seeing a more provincial type of scenery which I haven't seen for a long time. Laguna has more green fields and agriculture compared to Pampanga it hasn't lost its nostalgia and also its historical value for me. It will be a long drive to Laguna but it will be fun anyways. The team building seminar is sponsored by Community Innovation, Inc. (an Ayala Land, Inc. company) and the good thing about it is FREE including the bus going to and from plus the food, hotel accommodation at Caliraya Recreation Center. It was nice to have a company through Ate Tessa who happens to be our business partner, my mom's acquaintance and our top salesperson and Laila, who happens to be a site officer of Marquee Place Angeles City, Community Innovations project in Angeles City. Laila will accompany us on our first tour to Caliraya and with rest of the sales force coming from Metro Manila and other places. We arrived at Bonifacio High Streets at 6 A.M., it was a site to behold being inside the Bonifacio Global City for third time I was awed on how fast developments were. A site to behold as most of the people of all walks of life converge in this future city inside the former military base which was converted into a mixed used development. It was lush, with bright lights on the streets. Skyscrapers are already on the rise as I behold on the site of Serendra (the hottest selling property in the list of Ayala Land developments in Metro Manila). I see it differently in my view of making oppurtunities in selling residential condominium properties inside Bonifacio Global City. As we left the metropolis to Laguna, I see lots of road construction along the South Luzon Expressway and slow traffic in some section of the way with lots of detours, counterflows and barriers around. It was a long wait until we reached the city of Calamba, Laguna which is a definitely a historic place to visit for those who are venturing down south. The travel was leisurely as we went across town that I haven't seen along time from City of Calamba, to the towns of Pila, Los Banos, Sta. Cruz and later to Pagsanjan wherein it to took us about an hour and half to reach the sleepy and quiet town of Lumban. Lumban is 30 kilometers south of Metro Manila. It is quite an astonishing place to visit, lots of agricultural fields, mountain trails, less people and great view of the nearby Sierra Madre Mountains. 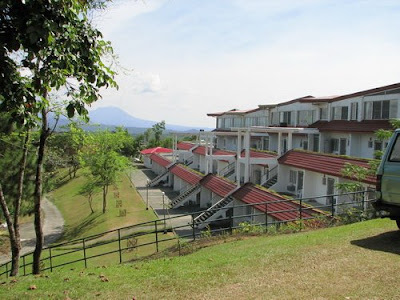 On top of those uphill road, you can already view the low-lying areas and nearby towns in Laguna. It reminds me alot of Bataan and Subic Freeport, Zambales minus the buildings and ships and less vehicles. We arrived at about 9:30 AM, Bus 1 was already there together with participant from the Southern area who have rendezvous at Shell SLEX in Sta. Rosa, Laguna. 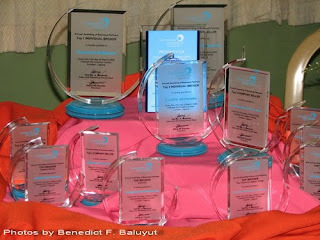 They did have 30 minute head start on their to Caliraya Recreation Center. As we arrived on the area, we have to cross the lake on a ferry and then travel by a jeep to the hilltop where the ALI trainors and marshals are waiting for us. 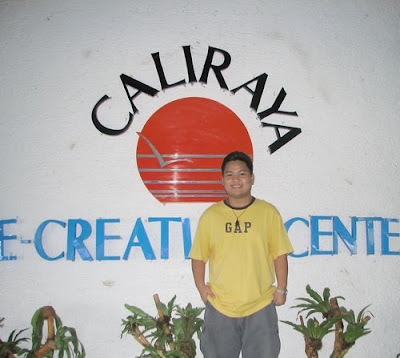 It was great and pleasurable travel in going to Caliraya with an awesome view of the lake, the mountains and its amenity areas. As we were waiting for our cue, our names were roll called and have assigned us to four groups composed of 12 to 13 members. Our first taste of the action was to meet, the trainor on the gazebo. Downhill slope was dangerous as we raced first. The gravity of earth is pulling us downward as I breeze on down to meet our trainers who were waiting for us on our first activities. 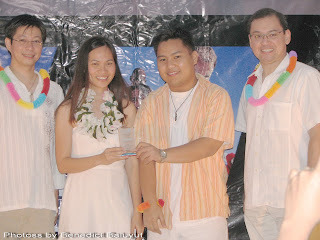 Too bad, we were second place and had not received the price money per group. Mr. Rex Mendoza, VP for Sales and Marketing for Ayala Land, Inc. (former President of AIG- PhilAm Group) was there on that event and gave us an short inspirational talk especially in the sales record the 5 year old Community Innovations, which is the youngest member of Ayala Land Inc. subsidiaries, achieved with total of 1.8 Billion pesos sales for 2008. CII and ALI were grateful with our efforts in marketing their projects and have they thanked us for being their outstanding sales force of achieving higher growth with their company. 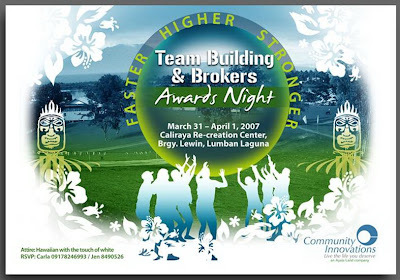 Together with Mr. Robert Lao of, Head of Sales of Community Innovations, Inc. (An Ayala Land Company) presented the awards on the Brokers' Night. It was great that our company and my mom's name was given an award as the Top Individual Broker and Best in Project Selling category in one project for achieving record breaking sales at Marquee Place in Angeles City alone. I do like to thank Miss Tessa for her efforts in helping our small company achieve this feat and beating the other teams in achieving that high sales in one project alone. 1st April, it was time to pack as I felt lonely as I leave this darn place full of memories which gave an inspiration of meeting sales people like me from different places and different backgrounds and also the young like-minded people like Architect Rico Yangco, Ely Belgica, Kuya Hubert Claveria, Mr. Alex Gaston and the others I have met all along the way. 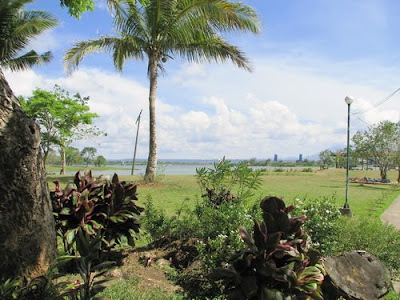 Visit Lake Caliraya Resort and Recreation Center at www.caliraya.net.